There are so many fun linkys going on this week, I just couldn’t resist joining another one! This time I’m linking up with Amy from Literacy and Laughter! Like me, she also has an obsession with children’s literature and is constantly buying books for her classroom! Gotta love that! So here is my classroom library! The books on these shelves are organized alphabetical by author. The bottom right hand shelf has magazines (in the turquoise magazine holder) and then all of our big nonfiction books that don’t fit in the baskets. On the right hand side of our library are the rest of our nonfiction books on top of the shelf. 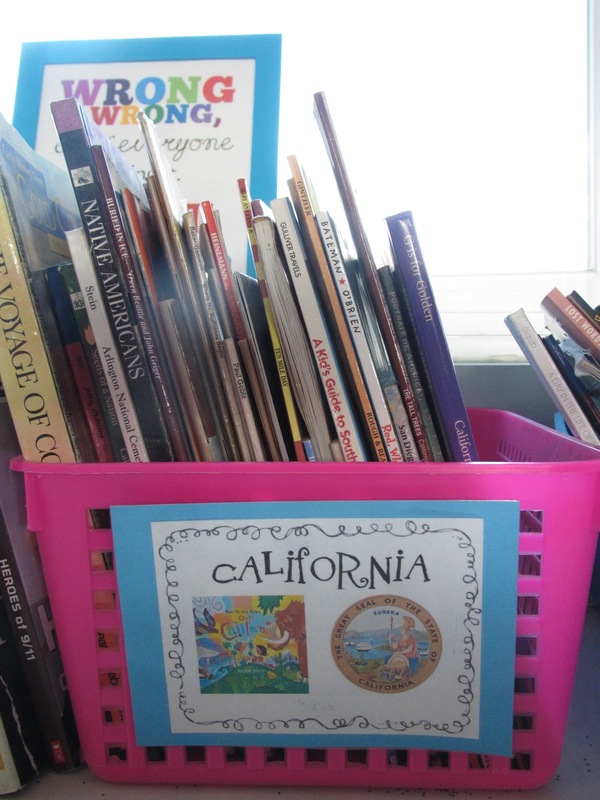 They are organized in four different baskets: science, animals/environments, California history, and sports. I obviously don’t have enough baskets and so the books from some of the baskets are overflowing and the I would really like to have more specific categories. This is why I don’t have tags up for all the baskets yet… I am still trying to figure out what I what them to be for the future! I should probably put something up for the time being, but the kids know by looking at the books what each basket is for! On the lower shelves are more fiction books organized by category. These shelves are tall and very deep, which is great for storing lots of things, but not so great for shelving books. I wish that they weren’t square-shaped and that there was a third shelf, but hey, gotta work with what I got! See what I mean about all the extra space? I can fit two more book baskets behind the ones that already are there! Of course then the kids couldn’t see the books as easily though, so I stick to just the baskets in the front. We have several pillows that the students can either use in the reading corner or move around the classroom during our Daily 5. I keep my library set-up the same all year. The student who is the “librarian” for the week helps keep it organized and changes out the books on display. I completely forgot to snap pictures of my kiddos book baskets, so I’ll have to take some tomorrow so I can post them up as well! I would love to label all of the books according to the Fountas and Pinnell reading levels. I love the way they are arranged, but I just think it would be good to help my students make sure they are reading good fit books. So there it is! 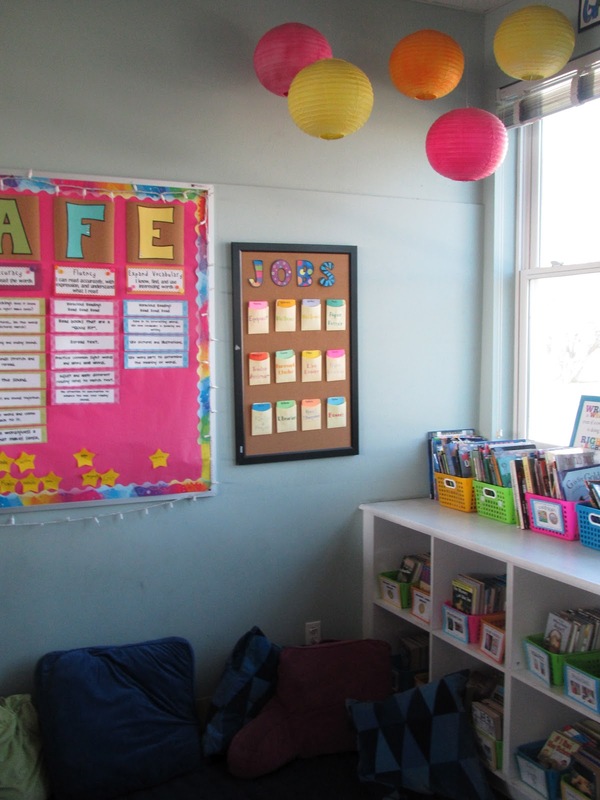 Head on over to Amy’s blog to see more wonderful classroom libraries! Love the bins and the labels. Cute and colorful! Your library is beautiful!!!!!! I want to move in there. Are your baskets from really good stuff? What size are they? I want to order new baskets but I don't know what size to get. Your library looks great! It looks super organized and inviting! . That's awesome! I love how colorful your little "nook" is. I love all the bright cheery colors in your library!! I want to separate my informational books out like you have yours. Haven't gotten that done yet. I am now following you! Thank you so much for linking up. I loved checking out your library and reading corner!! Love all of the colorful baskets and comfy pillows! Hi Molly!! I love your library!! Love your library AND your blog. Great minds think alike…I have the same baskets from Really Good Stuff too! Beautiful library! I love how coy and colorful it is! And the paper lanterns and lamp are nice touches to make it homey! Hi. Curious about your classroom library walls? What do you have posted? Just found your blog through Pinterest. I really LOVE the little holders that you use to feature certain books. I'm thinking I'm going to need to do that! Oh! I'm following you now. This is really a great stuff for sharing beautiful pictures. Keep it up .Thanks for sharing. This post is really helpful for me also in my future. Thanks for sharing.